Ukrainian leader Petro Poroshenko and comedian Volodymyr Zelensky took drug tests on Friday ahead of their election runoff as the ex-Soviet country's presidential race becomes increasingly sensational, AFP reported. Zelensky, a 41-year-old actor best known in for playing the president in a television show, is favourite to become Ukraine's next leader after he dominated a first-round vote on March 31, despite many dismissing his candidacy as a joke. Poroshenko, who is eager to make up lost ground before a run-off vote on April 21, invited his political novice rival to spar in an election debate. Zelensky agreed but laid down a number of unusual conditions including a requirement for both of them to undergo medical tests to prove they do not abuse alcohol or drugs. Zelensky also wants the debate to be held in the country's biggest sports arena, Kiev's Olympic Stadium, which seats over 70,000 people. 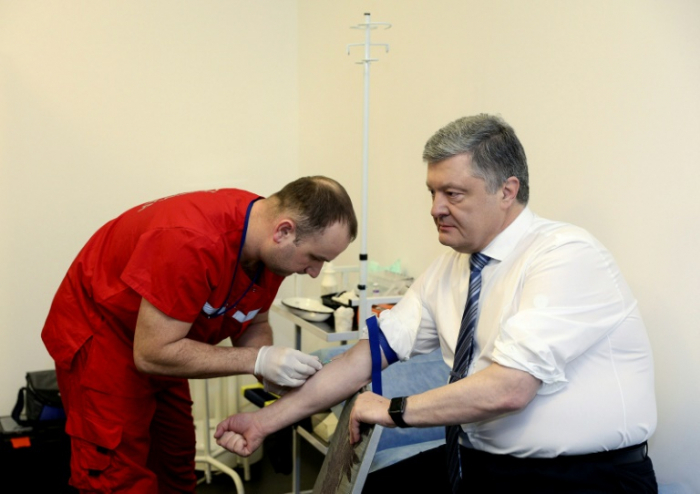 Poroshenko, 53, chose to play along, presenting himself to medics at a lab at the Olympic Stadium on Friday. He rolled up the sleeves of his white shirt and had his blood drawn in a video broadcast live on his Facebook page. "We are creating new traditions," a smiling Poroshenko said during the procedure. Doctors said they had also taken urine and hair samples. Speaking afterwards, Poroshenko said proving that candidates do not have problems with substance abuse was a "matter of national security". Volodymyr Yaryi, one of the doctors present, said the first results were negative. Zelensky chose to undergo tests at a private clinic controlled by one of his supporters, rejecting Poroshenko's offer to take the tests together. "I had my blood drawn, they drained me of all my blood. There's a lot of it, my young blood," he said in an apparent jab at his older rival. He said the results would be ready in three days. Zelensky stunned the country by winning more than 30 percent of the first-round vote, nearly twice that of Poroshenko who garnered almost 16 percent. He has shunned traditional rallies, instead performing satirical shows and blurring the line between reality and fantasy. The country of 45 million people -- which wants to join the European Union -- is mired in a smouldering war with Moscow-backed separatists in the industrial east.